Because of their sweet disposition, lovely song, and beautiful blue coloring, bluebirds have been a long time favorite of many backyard birders. Bluebird houses greatly help the species to thrive, as they provide not only a place to nest and raise babies, but shelter to roost on cold winter nights. With a severe decline in population in the early 70’s , a massive effort was launched to save these birds by pacing nest boxes along bluebird trails. 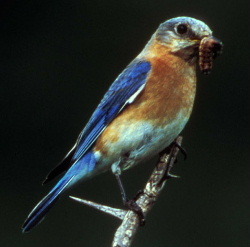 Due to insecticides, destruction of habitat, and competition for nest boxes from other birds, the bluebird population was almost extinct. Thanks to these efforts and education from the bluebird societies, the population has seen a great come back. 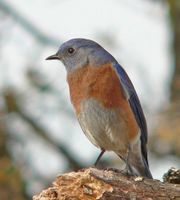 Bluebird houses appropriate with predator guards, and constructed to be competitor-proof are widely available today. 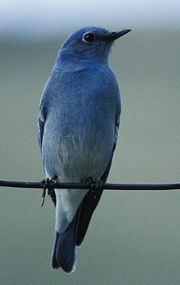 Look for one that is NABS (North American Bluebird Society) Approved. The long time symbol for love and happiness…bluebirds are a sure pleasure to have in your yard! Why Clean Your Bird Feeders? For those of us who love our backyard birds, filling the birdfeeders can easily become habitual. Our biggest concern on a cold day, or when we just catch a glimpse of activity, is if the feeder is empty. Next time please consider cleaning and disinfecting your feeder prior to filling…for the health and well being of your feathered friends. Diseased birds can quickly and easily spread diseases to healthy birds by visiting your wild bird feeders. 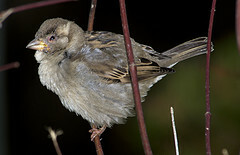 This house sparrow has conjunctivitis, a disease of the eye that most times leads to blindness, and probable death. The most common cause is dirty bird feeders. It’s a tough call, but some say to take down the feeder if an infected bird is seen, as the infection will spread rapidly to other birds. But this is where death to the sick bird will likely occur as it is unable to venture far for food and starves. By keeping feeders clean, you’ll minimize risk by removing harmful bacteria that builds up over time, and causes infections in birds. Simply use a 9:1 water-bleach solution (9 cups water to 1 cup bleach) to soak and/or scrub feeders, then rinse thoroughly. Cleaning bird feeders just once a month would be a good idea, for the health of your feathered friends. The same pesky squirrels that force you to put up baffles and barriers deserve a little treat now and then. They deserve something for their effort because after all, it’s no easy task hanging upside down while stuffing your face! Squirrel feeders are designed for those bushy tailed little rodents, though some of the more creative models make them work for their treats. You might find a corn cob on a bungee cord, or a windmill type squirrel feeder that provides hours of enjoyment for you and food for the squirrels. Let’s face it, some people might think it’s inhumane, but squirrels are used to retrieving food from tricky places, they’re natural scavengers after all. With a squirrel feeder in your backyard you will also help to deter squirrels from making acrobatic attempts to get past your squirrel baffles and barriers. It’s much better to fill two feeders once a week than one feeder three or four times a week because the squirrels are raiding your birdseed. Hummingbirds are one of the most unique bird species because of their ability to hover and their unique taste for nectar. Other than hummingbirds, orioles are the only other common bird species that drinks nectar, though hummingbirds tend to be more widespread. To make hummingbird nectar, all you need is sugar and water. In general you just want to mix 1 part sugar with 4 parts boiling water. If you haven’t time to let the nectar cool, mix 1 part boiling water to 1 part sugar, then 3 parts cold tap water. This dissolves the sugar quickly and cools the nectar for immediate use! 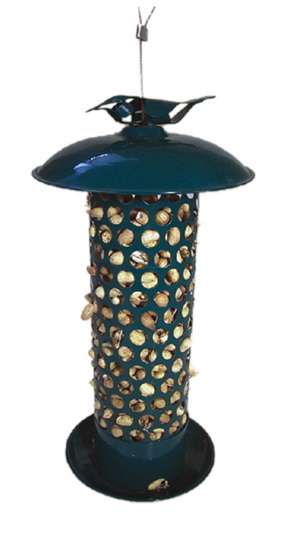 The nice thing about hummingbird feeders is the variety of styles available. 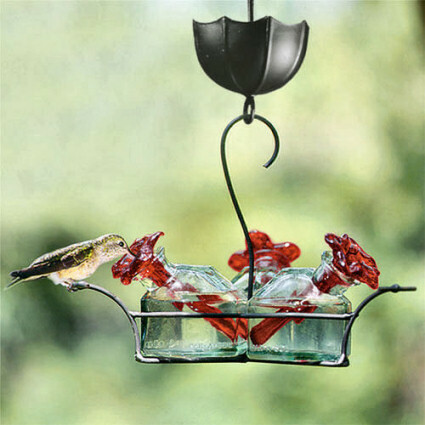 And by simply placing a hummingbird feeder outside, you should have visitors in just a few days, or even a few hours. The food is also easy to make and relatively inexpensive compared to other bird food, and hummingbirds will protect your yard from harmful insects. It’s a win-win situation!